Yes, we all paint the same thing. However we encourage you to really make it your own & take your art wherever you'd like. Fun art classes great for all ages & any skill level! All Kinds of Fun with Paint! Canvas, wood, wine glasses, & more! A variety of surfaces & projects! 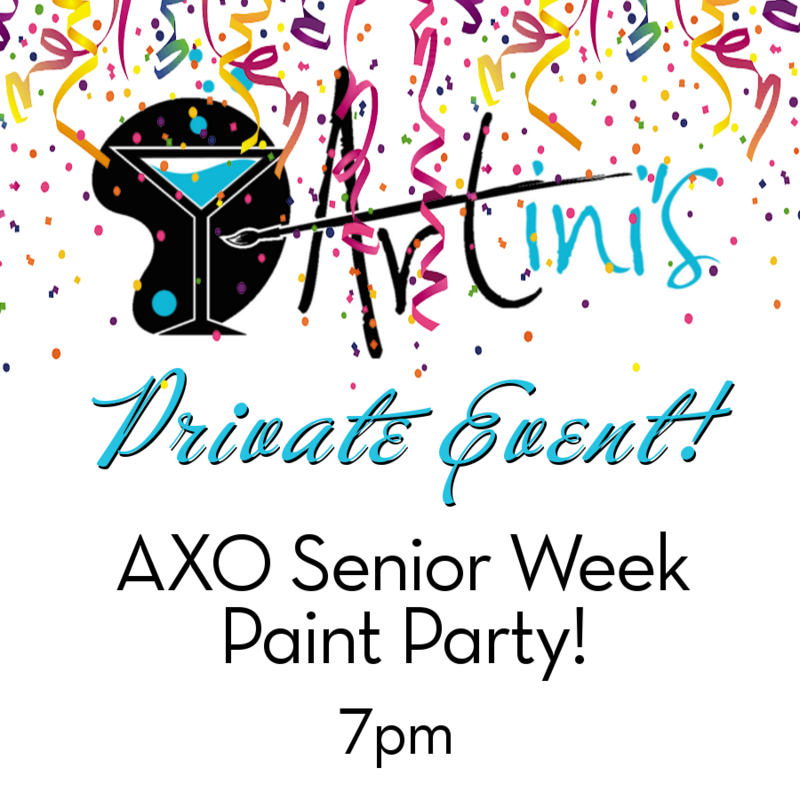 Up Next: AXO Senior Week Paint Party! Click HERE to be taken to ARTcamp information & registration. Ever wonder what we do here at ARTini's? Check out this video created by Athens' own DT Productions & find out! Never painted? No worries! It's true - Anyone can do this! We're here to help you through instruction and inspiration. All you have to do is look at our calendar, choose your painting or evening you'd like to come in, register & then show up! You can't go wrong with our step by step instruction and assistance - any skill level can do this and create something beautiful! If you'd like to drink adult beverages while you paint, we sell wine and beer on-site, as well as sodas and bottled water. You may bring in whatever food or snacks you wish. Your canvas, apron, brushes and paint are provided for you to use and you get to take home your very own piece of original art! Check out our calendar to sign up, and check out all painting offerings in our Painting & Stencil Galleries! *All artwork on our website was created by myself or my team artists. You may not copy without express written consent. A. Simple! Go to our Calendar and select the painting or evening you'd like to join us. Fill in the necessary information & click "Get Signed Up". The next screen is the secure payment screen. (I realize it feels like you're repeating information, but the reservation information is completely separate from the payment information.) If you do not complete the payment process online, please call the studio at 706.353.8530 to confirm your seat. A. Bottleworks has a small horseshoe shaped lot right off of Prince. You can try your luck there. OR, there is a large Bottleworks parking lot BEHIND the complex on Meigs. Bottleworks is now charging for parking and managing the lot in order to cut back on people parking in our lots and going elsewhere. It is free for the first 1.5hours, then $2 for the next 1.5 hours, then it goes up to $4 if you're here longer than 3 hours. This has actually cut back on the abuse of our parking lots greatly, so there is always room for Bottleworks patrons. There is street parking all around, and the businesses across Prince that close at 6pm don't tow. I always suggest carpooling, anyhow, to cut back on energy and space consumption. Also Uber & Lyft are great options, especially if you plan to consume alcohol. Q. May I bring in alcoholic beverages? A. No, you may not. It is the law - It is Clarke County ordinance which does not permit establishments such as ours to allow people to bring in their own alcohol. We are therefore licensed to sell wine & beer for consumption on premises. We have a nice selection of red, white, sparkling wine, as well as sodas, Vitamin Water, Coconut water, and juices. Q. May I pay at the door? A. Yes, you may pay at the door, but it does keep everything streamlined at the front desk if you pay online. If you prefer to pay at the door, just call or email in your reservation: 706.353.8530 or kate@artinisartlounge.com. If you have a pay at the door reservation, and you are no longer able to attend, please call us to let us know not to expect you.